Packed with useful features and handy options, the FRIGIDAIRE FAQG7072LR gas dryer is not even a complicated appliance. On the contrary, the product is easy to use via Express Select Controls that require the user to press buttons. The model contains most of the Affinity Series mainstay features but with the added comfort of a Sanitizing Temperature level. The FRIGIDAIRE FAQG7072LR gas dryer does not come with an Energy Star certification. However, it does have an Energy Saving option for consumers who are either concerned about their monthly energy bills or the usage of environmental resources, or both. The option saves up to 35% of regular energy use. The product also does not have an NSF certification. When a product receives such a certification, it must have displayed enough germ or bacteria killing power. The FRIGIDAIRE FAQG7072LR does have a Sanitizing temperature level. The user can choose that level to kill 99.9% of the germs and bacteria that have managed to stay in the garments. DrySense Technology is primarily responsible for delivering clean, wrinkle-free garments. This technology enables the dryer to thoroughly remove moisture from the garments without damaging the fabrics. Wrinkle Release Technology, part of the available options, also reduces the wrinkles found on the garments. A Delay Start of 1 hour to 12 hours is available in the FRIGIDAIRE FAQG7072LR. With this feature, the user can set the time that the chosen drying cycle will start. He must ensure that he has set the right settings he had in mind. The gas dryer records and keeps the last settings. With a touch of a button, the user can choose the settings for a particular cycle. This is through the use of Express Select controls in the design of the product. The FRIGIDAIRE FAQG7072LR is an Ultra-Capacity dryer, as evident by its 7.0 cubic feet capacity. There may be other dryers in the market that will slightly exceed this capacity but all in all, such a size is considered among the maximum. 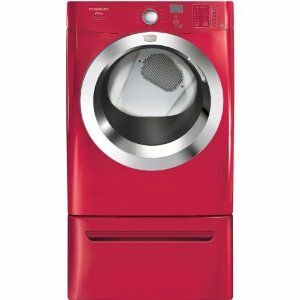 Though this particular model has a Classic Red exterior, there are dryers with the same exact features and options with different exterior colors, such as Classic Blue, Classic Silver and Classic White. The drum is made of rust-free stainless steel. The use of DrySense Technology allows the FRIGIDAIRE FAQG7072LR to produce dry but wrinkle-free clothes. The controls are easy to figure out and use. The drum is made to last. The existence of the Sanitizing Temperature level gives the user a chance to kill most of the bacteria found on particular loads. There are some good convenience features, such as the Delay Start. The FRIGIDAIRE FAQG7072LR has not been granted an Energy Star certification. The product does not have an NSF certification despite the fact that it has a Sanitizing temperature level.